1930s rings were often highly textured. Vintage bridal jewelry such as 1930s wedding rings can be a unique and elegant option for couples interested in pieces with unusual styles and sophisticated appeal. Finding vintage pieces can be a challenge, however, and couples should be familiar with the available styles and how to find exceptional antique rings if they are truly interested. Why Choose a Vintage Ring? Couples may choose vintage rings for a variety of reasons. Vintage and antique ring designs have unique, charming characteristics that are hard to find in more contemporary styles, and brides- and grooms-to-be may simply appreciate the more unique styles available in older rings. Antique collectors and individuals who have studied the jewelry of older periods, in particular, may be interested in vintage styles, or couples may choose to honor their grandparents or great-grandparents by choosing ring styles reminiscent of other rings in their family. For some couples, the rings themselves may be sentimental heirlooms with deep emotional connections. Whatever the reason, couples can thoroughly appreciate the beauty, delicacy, and design of 1930s wedding rings by learning what styles are available, how to care for the rings, and where to find the best vintage selections. Victorian: These elaborate rings included many romantic, feminine accents such as lace filigree patterns, flowers, and other delicate designs. Small gems may be used as accents or the rings could be fashioned entirely from metals. 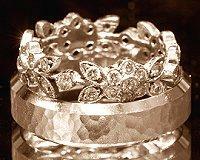 Edwardian: Like Edwardian engagement rings, these wedding rings included both geometric designs and filigree patterns. They are generally larger, bolder patterns than Victorian designs but share many elements in common. Art Deco: Wedding rings reflecting the popular Art Deco era feature bold geometry, larger gemstones, and thicker, bulkier designs. These are especially popular options for men's wedding rings. Simple: Couples hit hardest by the economic ravages of the Great Depression often chose the simplest rings. While they may still have incorporated small gemstones, they were more likely to have metal detailing and be thinner than wedding bands from other eras in order to keep prices more affordable. Today, the beautiful patina of age and the delicacy of the designs is greatly sought after. The delicacy and intricacy of 1930s jewelry, particularly wedding rings, adds beauty and character to these gorgeous designs. Interested couples should note that antique collections can vary, and the pieces that a dealer has available today may not be available tomorrow. At the same time, couples should not rush into a purchase before thoroughly investigating the ring to ensure it is a true antique rather than a reproduction, replica, or 1930s "inspired" ring. An independent appraisal is a wise precaution against potentially fraudulent pieces, and many times reputable jewelers will offer appraisals as part of the rings' documentation. Couples who choose 1930s wedding rings will need to care for them well to guarantee their brilliance and value. Adequate insurance can help protect the ring against damage, loss, or theft, and a professional jeweler experienced with antique pieces should inspect the rings periodically to check the security and integrity of the settings. Delicate cleaning can help the rings keep their brilliance, but harsh chemicals should not be used for fear of discoloring the metal or gems. Embrace the '30s vintage style. 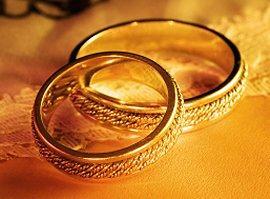 While antique wedding rings are beautiful options, they are not suitable for everyone. The delicacy of the rings can make them more prone to damage, particularly if the bride or groom has a highly active lifestyle. Because of the intricacy of the rings, resizing may not be possible, and the unusual vintage designs may be difficult to match to an engagement ring for a coordinated set. Choosing 1930s wedding rings is a way for a couple to embrace the romance and elegance of a bygone era with enduring symbols of their love. Vintage and antique rings are lovely pieces, and with proper consideration they can be stunning choices for a stylish couple.